We design attractive and usable marketing banners of your services/products across different media such as apps, search engines and videos. We create potential customer databases for your business and send professionally designed newsletters with interesting information about your company. We analyze the structure of your current website and we give you a Valuation Report. This is how we started to improve your website so that it appears with better positioning in the different internet search engines. We create advertising spaces of your company within social networks like Facebook, Twitter, Instagram, YouTube and many more. We also become professional Community Managers to aid you on selling your products and services. Use the internet as your number one selling platform by having promotional videos of your company, as well as a website that works as a Point of Sale. You will certainly increase your profits, guaranteed! A website should always be eye-catching, easy to navigate and above all it should have information which is constantly updated in relation to your special deals, promotions, products, services, news and more. 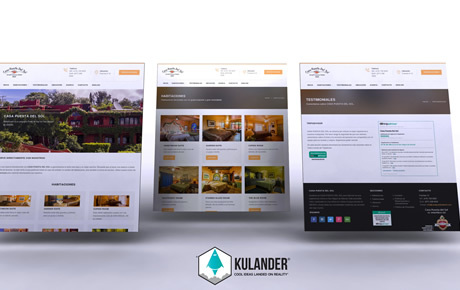 Contact Kulander® to find out all the details of a website specifically developed for your business. We film and publish promotional videos of your services and products. Did you know that YouTube is the second most used search engine worldwide?